Here is an excellent post from another blog: The Dirt Doctor! Please do share the info. What seems like an innocent fourth-grade science project is actually an informative and effective account of the effects of a commonly used chemical herbicide called “bud nip.” The produce man at the grocery store informs Elise that the first potato won’t sprout any sweet potato vines because it has been sprayed with bud nip. According to the Pesticide Action Network, the dangers of bud nip include toxicity to amphibians and honeybees, important pollinators of crops we eat every day. Bud nip can be found on potatoes, kale, peaches, broccoli and other common fruits and vegetables. Shop in the Green Living Store for all of the products I recommend in the Organic Program. Products are also available in the Dirt Doctor’s Corner of your favorite Garden Center. P.S. Start 2012 with the resolution of healthy eating and living with a membership to the Organic Club of America! Memberships are also great gifts. Members can log in on Sunday mornings to see the Dirt Doctor’s Live Broadcast. Predators have 2 eyes in front! 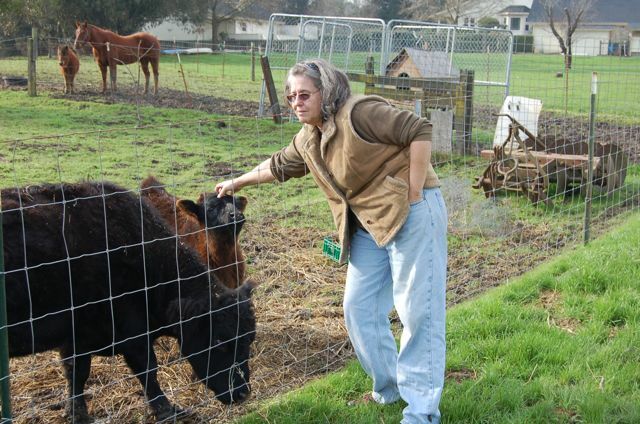 When people visit the farm one of the first things we talk about, before seeing the livestock, is how to interact with our cows and horses (& mini-horses). We bred for temperament so we start out with fairly mellow livestock… but it’s important to understand where they, genetically, are coming from to avoid triggering survival instincts. These animals have historically been prey, i.e. food. They have developed some pretty strong instincts that allow them to survive in the wild. Animals (predators) that hunt them down have two eyes, that work together in front, that will stare at them! Prey (future dinner meal) animals have eyes that look to the side and each eye actually works independently. One eye can look behind and the other can look ahead… almost 360 degree vision. AMAZING. Their brains can make some sense out of this information. Safety & survival. If your eyes are in front, you can’t see behind you or to the side very well, without turning your head. But two eyes working together are better at judging distance, when you are in attack mode! We had a cow who, I swear had surround vision! She could, with one eye, watch her food, and with the other eye, wait until we were in kicking range while milking. Grrr-r-r-r. Predators also reach out with a stretched out open paw, claws extended, to attack. Guess what people automatically do? 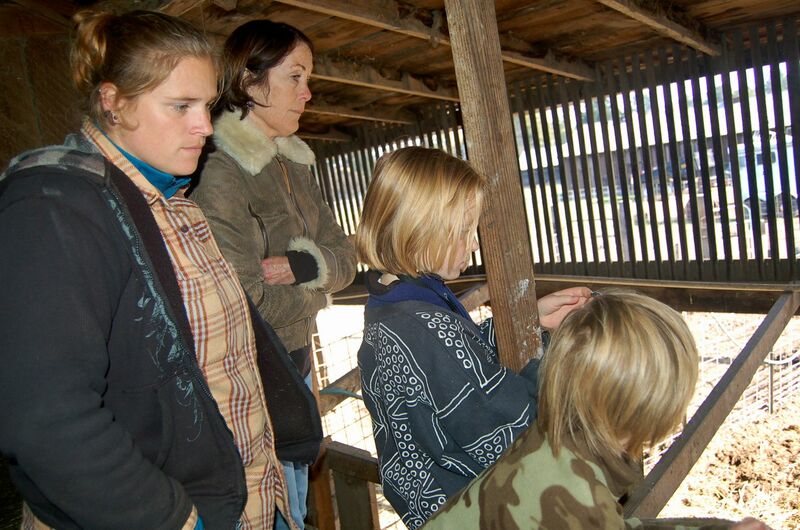 Reach up and out with extended fingers, to touch livestock on the head. Prey animals are very sensitive to certain movements that humans make so we try to decrease their stress by encouraging visitors to do several things. Our goal is to make “socializing” positive for both sides, human and animal. looking directly at them (with both eyes) look away occasionally, to take the stress off them. I’ll turn my head slightly, so they can only see one eye. 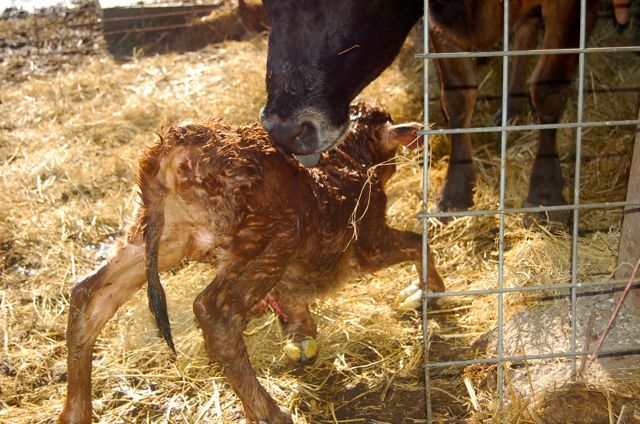 I still do this with a “new mom” as she may be extra nervous with a newborn calf at her side. Two, don’t reach up and out with an open hand, to touch the animal. Put your hand out down low, with the back of your hand showing (fingers tucked away)… and let the animal reach out to you and sniff your hand. THEN you can turn your hand over, and touch them. They can be incredibly sensitive & gentle with their muzzles. Three, talk quietly, slowly, and in low tones. High pitched tones come from bobcats, etc! Four, move slowly, and give them time to adjust to where you are moving to. ALWAYS let them know, quietly, if you are directly behind them to avoid spooking them. (They cannot see directly behind themselves.) FAST movements are perceived as a threat (predator after them). Using these techniques works well. The other interesting thing.. you don’t actually have to go directly up to the animal. If you stand or sit still, they will come to you. They are incredibly curious and as long as they don’t perceive you as a threat… they will want to meet YOU. Teasing Chocolate… being a bad boy! Our Cocker Spaniel, Mick, loves to play with the new calf. He thinks it’s HIS new playmate. But mom has other ideas. Because Mick has front eyes, moves quickly, and makes “attack” movements, she see’s him as a threat to her baby (despite knowing him since he was born!). He’s making a nervous wreak out of our new mom. Poor Mick… he get’s put on a leash so that he will NOT tease Chocolate. He’s only allowed to go out “under supervision”! Our area got hit with over 6 inches of rain!!! It quickly creates a river that runs between the house and the barn, and pools into a shallow lake in the pasture. We’re quite lucky that the pasture area drains fairly quickly. Despite it being winter this was a relatively warm storm. No freezing temperatures. 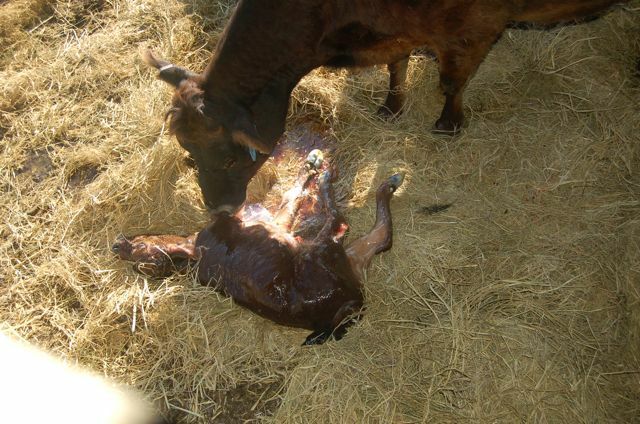 Glad that our newborn calf had a few days of warm, dry weather before the start of the rains. He handled the change in weather without a hitch. Kicking up his heels and playing…. instead of curled up in a miserable lump as I fantasized. It’s a pretty human characteristic, to super-impose our reactions onto animals. Barns are mostly for people… for storing items like tools, hay, feed, etc. We don’t use the barn for our livestock. Overall, it’s not healthy for them. Cows, horses, etc. prefer the outdoors and tend to choose a tree or windbreaks for their shelter. Livestock closed up in a barn are at risk for respiratory problems… the build-up of manure and urine produces fumes that are irritating to their lungs. They have survived for tens of thousands of years… outside. Well, except for our chickens who are closed up inside the barn at night, but only because it was a convenient place to put an enclosed cage to protect them from predators. Not that THEY needed the barn. It could be in a chicken tractor, outside. Now, our weather here in coastal california is rather mild. We don’t have drifts of snow for livestock to dig through, looking for food and water. Instead our chickens, turkeys and guinea hens roam freely, except at night, where we have closed down The Heritage Barn Chicken Buffet that a Red Fox, last year, helped himself to. The calf did not miss a beat… he frolicked and played in the rain. His coat is thick and water-resistant, seemingly untouched by the steady rain. We had three days, off and on, of rain. 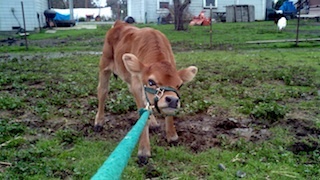 Of course, then it came to the time to put a halter on the calf and get him used to being led around. You can see from the picture how excited he was about this new adventure. He actually acclimated rather quickly and our intern was able to led him around the pasture. Niki, our intern, also discovered the easiest time to put the halter ON. 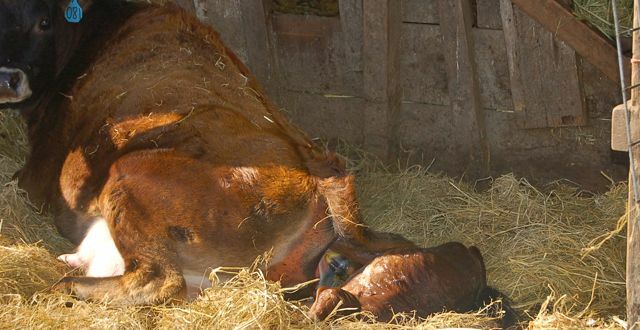 When the calf was napping! They are almost dead to the world. You can do just about anything to them and they don’t wake up. And mom has usually parked the calf, for his nap, and she’s gone off to eat so she’s not there to run interference in putting a halter on her baby. We’ll try to lead him around a short while each day… and spend time with him, socializing. Then he is let off the lead rope, races over to mom, and get’s a comforting drink of milk! The calf finally balances enough on his little legs, to actually MOVE around! You can hear the pig in the background… he was SO curious about what was going on! Our Midget White Turkey hens have started laying. Never-mind the fact that this is the middle of winter (well, maybe that is the confusion, this winter has been so warm) and they are confused. Coming in with the chicken eggs, we’re finding large speckled turkey eggs. Over a few days we’ve collected 4 of these eggs. In just a few more days we should have at least 6-7. While our midget is laying consistently, it’s unlikely that she will sit on her eggs, especially as this is off-season. 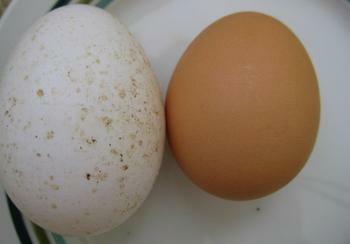 Turkey eggs take 28 days to hatch… and I have a broody hen. A hen that is insisting on incubating some eggs. So we will play the switcheroo game. When we have collected enough turkey eggs, I’ll remove the hen’s own eggs and put them in the incubator to complete their 21 day incubation. I’ll replace her eggs with a new batch of turkey eggs. Lucky for me the hen will keep sitting until those eggs hatch, even though turkey eggs take longer. If we get really fancy, we’ll take some of my prime chicken eggs, and 7 days after the turkey eggs are started, we’ll put the chicken eggs under her, as well. They should all hatch within 48 hrs of each other. Now why would anyone in their right mind do this dance? Because turkey chicks are notoriously difficult to raise. AND are VERY expensive to order from the hatchery. Roughly $10 a chick, and a 50% survival rate is the norm. That makes it $20 cost base for each surviving turkey. If we can find a way to raise our own chicks, we are way ahead of the game. While I can incubate the eggs to get them to hatch, it’s raising them up that is the problem… but mother hens do it without missing a beat. They will raise their chicks, turkey chicks, guinea chicks, just about anybody’s chicks I think, and not lose a one! It’s awesome to watch. She’ll even raise a combo… chicken & turkey chicks at the same time. We’ve had a momma hen hatch out 2 little chicks, and I’ll give her another dozen (slip them under at night, just after her chicks have hatched). She rises up in the morning and the baby chicks just keep streaming out from under her. Good thing for me hen’s can’t count! She does the job without a hitch. And we have the fun of watching the mom teach the babies to scratch and hunt for food. If everything goes according to schedule, my broody hen should hatch out at least 6 turkey chicks… without me having to do too much work, while letting her do the work she does best. By the time she is ready to leave her little flock, the turkeys will be able to hold their own. 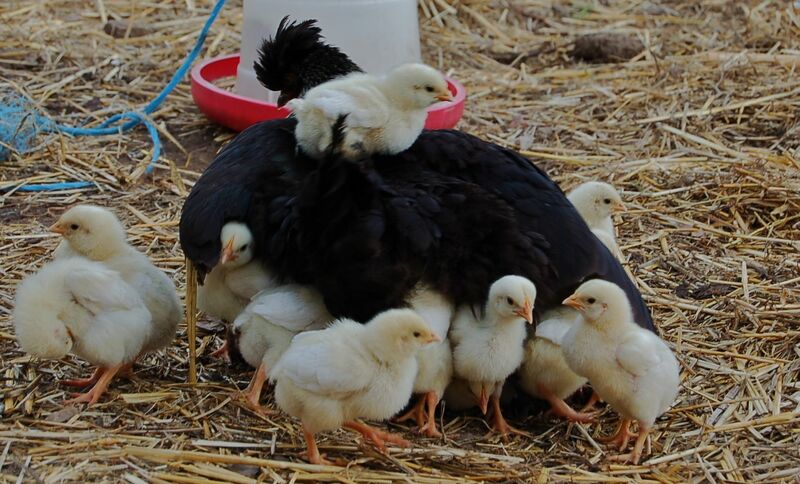 It’s a variation on sustainable but as the “broodiness” has been bred out of turkeys it is difficult to get the to sit on their own eggs, or get them to raise their own chicks. Kinda sad really. 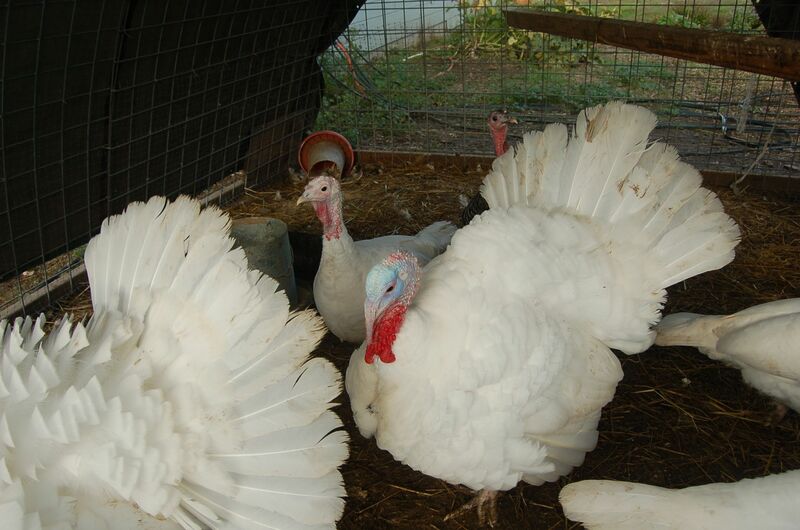 Commercial turkey’s breast are too large to allow mating, so they must be A.I.ed (artificial insemination). But at least OUR turkeys can breed on their own! At least we’re getting a bit back to the historical norms… not all the way, but at least, some of the way. Niki, our current intern, wanted to try milking Chocolate. I wanted to make sure each quarter of Cho’s udder was functioning properly. 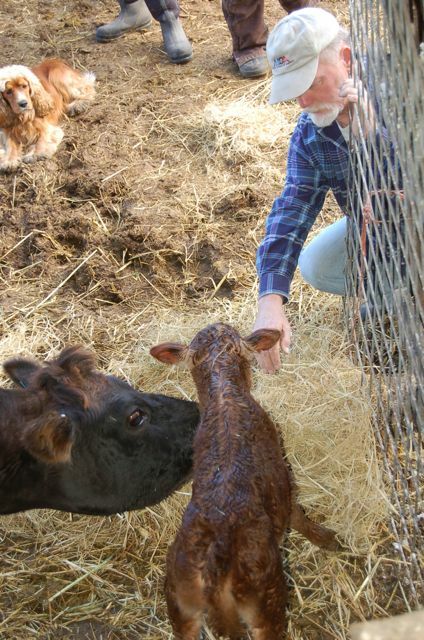 The calf had nursed, but it was important to make sure each teat was open and that each part of the udder could empty. 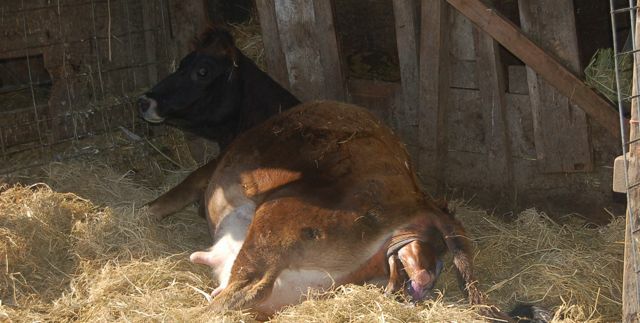 If not, it could be a perfect setup for mastitis, infection of the udder. 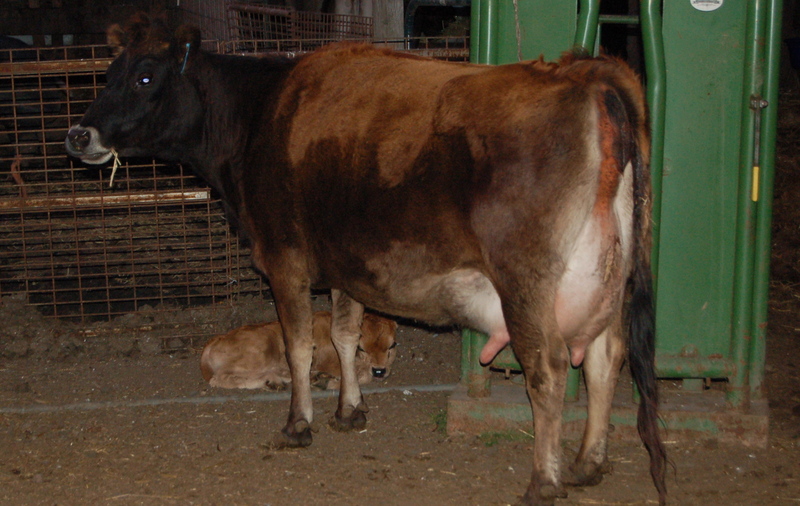 An udder is divided into four segments, each with a teat. 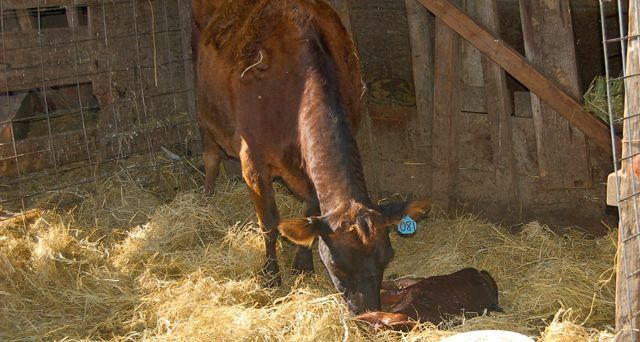 The first milk, after delivery, is the colostrum which has many health benefits for the new calf. 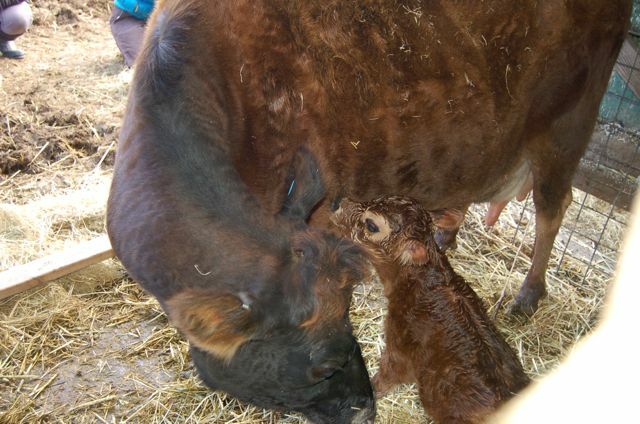 But the mom produces much more milk than the calf will be able to drink… so we will take some for possible future use. We didn’t want to separate mom & calf by taking Cho into the milking trailer so Jim just put a halter on her and tied it to the feed stall. The problem with that… she had much more room to move around. Cho had not been milked in a year so was not too pleased with the change. 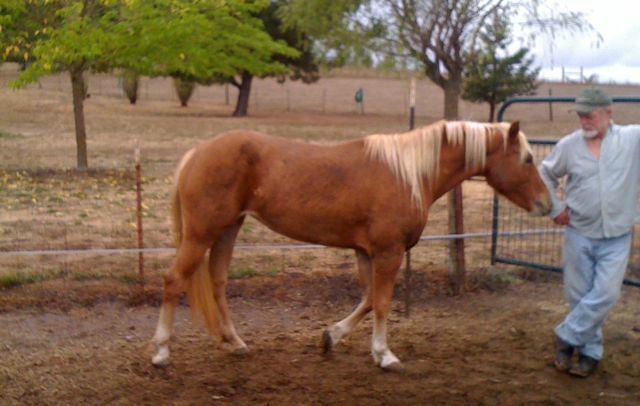 Jim hobbled her back leg so she could not kick. When a fresh cow is milked initially, it will trigger contractions (painful)… so again, she’s not too happy about being milked BUT, very important to make sure each quarter of the udder is working properly. It’s a good thing the hobble is in place ’cause she does try to kick! She dances around the stall area and Niki has to be quick and observant on what Chocolate is doing. When you lean up against a cow, to milk, you can actually feel when she is getting ready to kick… you grab the bucket and tilt back… she has a very specific range that she can kick into. Once in the milking stall we will have more control, but we’ll wait a few weeks before we start to take milk. Hand milking is quite an art… as well as requiring some good hand endurance. You don’t need a lot of strength, but you do need to be able to keep up the motion for a while. 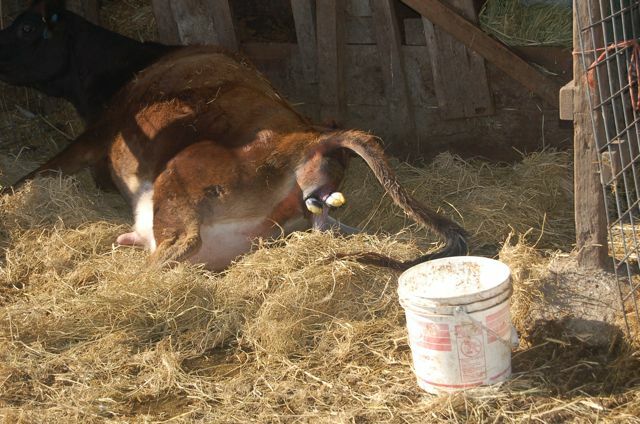 Our other Jersey, Bessie, does NOT like to be hand milked. She thinks we take way too long! 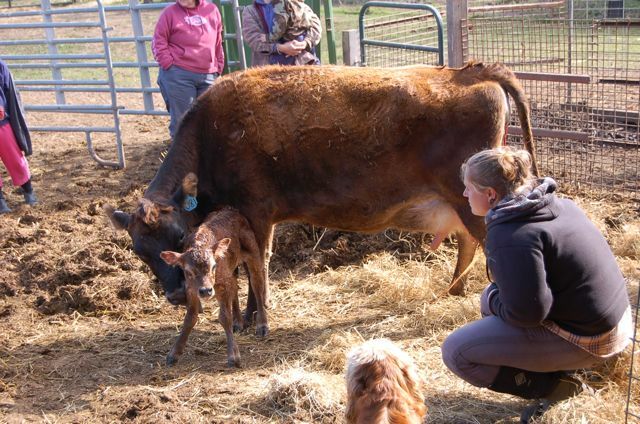 Milking is not just clenching a fist around the teat, but a rolling motion. You actually close off the top of the teat (so the milk will not squirt back up into the udder), and then squeeze down, from top to bottom, to move the milk out. It’s a rolling motion, top to bottom. Once you have enough hand endurance/strength you can get a nice rhythm going. Hand milking should be done in 20 minutes at the most. It only takes about 10 min to do the job with a small portable milking machine, but it takes me longer to CLEAN my automatic milker , then hand milking takes! The challenge is to build up the hand endurance. We check each quarter of the udder, and get a good flow of milk from each. Collect about a quart of colostrum, for freezing. 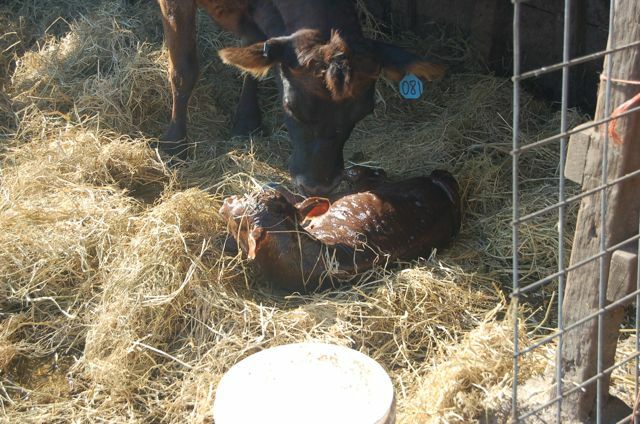 And then let Chocolate go nuzzle her calf, who has not budged from his napping spot.